Mohr Partners, Inc., a global corporate real estate advisor, has appointed Patrick McNulty as a Managing Partner in its Philadelphia, PA office, joining Thomas McLaughlin, Managing Partner. Mr. McNulty brings over 20 years of commercial real estate experience. He has steadily built a reputation as one of the top brokers in the Philadelphia area, holding senior positions with The Flynn Company and, prior to that, Albert M. Greenfield, Inc., before founding Berkshire Real Estate Advisors. He has personally completed over $500 million in sales and lease transactions, and holds a Real Estate Broker License in the States of Pennsylvania and Delaware. Born and raised in the Delaware Valley, Mr. McNulty has as an inherent knowledge of the local and regional real estate markets. During his career, Mr. McNulty has represented owners and tenants in successfully negotiating over 10 million square feet of leasing and sales transactions throughout the Delaware Valley. From 1996 through 1998, he was responsible for the redevelopment and successful leasing of what was formerly Scott Paper’s headquarters, a 650,000 square foot complex adjacent to the Philadelphia International Airport. 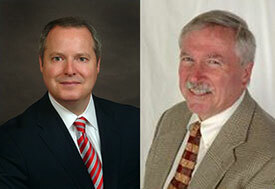 Mr. McNulty joins Thomas McLaughlin as a Managing Partner of Mohr’s Philadelphia office. Mr. McLaughlin formed the Philadelphia office in 2004 after 30 years of corporate experience in finance and the strategic planning and management of real estate and facilities. Prior to joining Mohr, Mr. McLaughlin spent most of his career in the chemical industry where he built and led strong teams, initiated cost effective productivity improvement plans, divested profitably more than $250 million in corporate property earning him recognition as best in class for divesting idle assets. He has been a speaker at various real estate professional organizations on the subject of Brownfield Redeployment and has organized focus groups in the heavy industrial sector to discuss common issues, failures and successes. “We are pleased to announce the addition of Pat McNulty to our Philadelphia office. Tom has built a strong office since founding the Mohr Philadelphia office in 2004, and Pat will further solidify Mohr’s presence in the Northeast,” said Ted Fredericks, President of Mohr Partners.